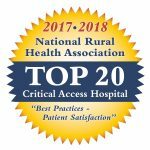 For the second year in a row, Grace Cottage Family Health & Hospital has been named one of the Top 20 Critical Access Hospitals (CAHs) in the country for “Best Practices – Patient Satisfaction” by the National Rural Health Association (NRHA). Grace Cottage achieved this exclusive “Top 20” designation out of all 1,346 CAH facilities throughout the U.S., and it is the only CAH in the eastern United States to receive this Top 20 Best Practices – Patient Satisfaction award this year. Grace Cottage Family Health & Hospital scored in the Top 20 for “Best Practices in Patient Satisfaction” among all Critical Access Hospitals in the nation because of the hospital’s high rankings on the Patient Perspective Index (PPI). The PPI measures the “overall rating” given to Grace Cottage by patients, and the frequency with which Grace Cottage’s patients state their likeliness to “highly recommend” Grace Cottage as a healthcare organization of choice. The Chartis Center for Rural Health, a comprehensive advisory service and analytics group serving the health care industry, was responsible for tabulation of the data and reporting of results. Serving healthcare needs of patients in and around Windham County since 1949, Grace Cottage Family Health & Hospital provides 24/7/365 emergency care; inpatient care; physical, occupational, and speech rehabilitation; primary care and mental health services; a retail pharmacy; and ancillary services. It is located on Route 35 (Grafton Road) near the intersection of Route 30, in the center of Townshend. Its Community Wellness Center offers a variety of wellness classes and support groups. For more information, visit www.gracecottage.org. NRHA is a nonprofit organization working to improve the health and wellbeing of rural Americans and providing leadership on rural health issues through advocacy, communications, education and research. For more information, visit RuralHealthWeb.org. View a complete list of all Top 20 Critical Access Hospitals here. Read about the Top 20 selection criteria here.